Runner Up! Best Confidence Boosting Product 2017 as voted for by SkinStore customers. The NuFACE Trinity Facial Trainer and ELE Attachment Set transforms your anti-aging skincare regime, providing a powerful system that visibly reduces the appearance of wrinkles and sagging skin from the comfort of your own home. Utilizing innovative microcurrent technology, the set combines the NuFACE facial trainer alongside an ELE precision head and gel primer for maximum results. The award winning NuFACE Trinity Facial Trainer is an effective microcurrent treatment packed into an innovatively-designed device, with interchangeable treatment attachments. Designed as a solution to the visible signs of aging, the device works to stimulate both the large surface areas and small contours of the face, creating similar results to a facelift, however the treatment is pain free and can take only 5 minutes. Mircrocurrent devices mimic the natural current of the body, which slows as we age. Going deeper than the surface, the toning device visibly tones the facial muscles, improving the contour, evening the appearance of skin tone and visibly reducing fine lines and wrinkles. Safe and effective for all skin types, NuFACE Trinity leaves the complexion looking youthful and visibly supple. 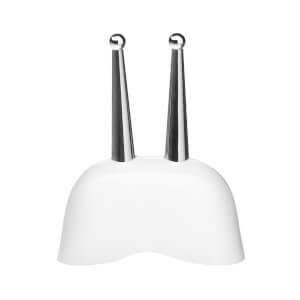 The ELE attachment is designed with two small tips to precisely target the hard-to-reach areas of the face that can be susceptible to visible signs of aging, including eyebrow furrows, crows feet and smile lines. The lip and eye attachment works to reduce the appearance of fine lines and wrinkles, for a younger looking face. 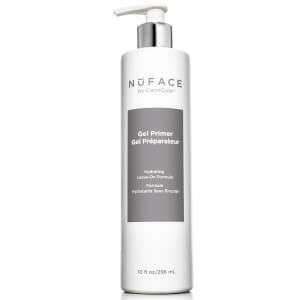 Prepare for the NuFACE Trinity device with the Gel Primer. The lightweight formula allows for the device to glide across the skin easily, whilst ensuring maximum microcurrent conductivity for optimum results. Suitable for all skin types, the formula is water-based and extremely easy to remove. Use the NuFACE Device at least 5 times a week for the first 90 days. After that, use 2-3 times a week to maintain results. Start by washing your face with an oil-free cleanser. Men should shave before use as hair can interfere with the conductivity. 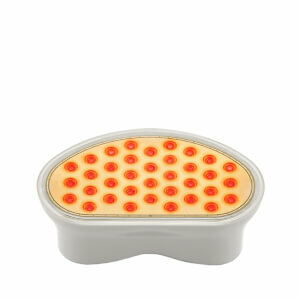 Glide along the natural contours of your face, in an upward motion. Each glide should last five seconds. Remove the NuFACE Primer with a warm, damp washcloth. Apply your favorite NuFACE Serum (optional) and preferred moisturiser. I have been using my NuFACE for almost three weeks. After the first session my girlfriend commented to me “oh my gosh you look 15”. It makes my skin feel bright and tight. I love it and it has become a part of my morning routine with ease! Very good device, love it, shipping took 4 weeks. Love it a lot. My skin is firmer. If you are like me and are trying to figure out which one to get the trinity (full size) or mini get the full size. I got both, but if I was to do it again I would go for the full size. The trinity has more power, the mini just isnt smaller in size it has a smaller battery so you can only do the basic strokes and not 5 sec more. The trinity has a lot more power it can got for 20min and you have the power to do the optional strokes. You just cant leave it connected (like a cell phone and keep on using it when the battery is flat/or low) it turns its self off. The full size also lets you increase the power setting. I have been using it for a month so far, so maybe i need to give it the full 60d for full effect, but unlike others I do not see any immediate result, and expecting that is probably unrealistic. . The difference at this point is probably only one that I would notice. (I am 49 and would like to minimize laugh lines and periorbital area-hollow under eyes). So I dont look like the 19yo girl with perfectly smooth skin on the nuface box just yet. I am hoping that I will see more improvement after 60days. Doing the basic strokes recommended, can be done <10min which isnt bad. The gel it comes with works, but its a small tube and i thought overpriced. When it runs out I plan to buy aloe vera gel (with no preservatives or alcohol added) its a lot cheaper, water soluble, and will do something positive for my skin. So far the only negative, is the best way to learn techniques is with utube videos, nuface has some online, so hunt them down before you use it. this isnt int he box but will help you get the most out of your nuface. I've had this device for a few weeks now. Ever since the first use, I've noticed slight uplift in my eyebrows, and cheeks, as well as a more defined look for my jawlines.I use this device for about 15 minutes daily in the mornings. 10 minutes with the packaged trainer and 5 minutes with the ELE attachment. People compliment me on my healthy and youthful glow, and I have noticed that my skin has become softer, smoother, and red patches are gone. My previous sensitive skin condition has improved as well.Everyday that I wake up, I find my skin in better condition: rested, hydrated, and glowing. I've never looked better and I'm in my late 30s.This is the best combination you can get with Nuface, the trainer is good for big areas, but you also still need the ELE attachment for more delicate areas.I highly recommend this for all my friends and family.